Each featured work has it's own page with more photos and information about the piece. Click on the photos above, or use the buttons below. As some of the oldest materials used by nearly every civilization on earth, ceramics and metal have long histories. My inspirations range from museum pieces and archaeological finds, such as the body chains from Rome and the classic pottery from Greece, to personal experiences I had in the Navy. The use of fire in both of these mediums fascinates me. This heat softens the metal, allowing me to form it. In contrast, fire hardens the pliant clay and leaves evidence of itself on the surfaces. My metalwork plays with ancient concepts in fresh, unexpected ways. I combine styles ranging from Ancient Greece to Victorian England with modern designs to create pieces of wearable art. While I dabble in sculpture, I am drawn to jewelry techniques and forms. Body adornment is culturally universal, with each collective creating and sharing their aesthetics. I am careful to be aware of cultural sensitivities while exploring forms that speak to me. My recent ceramics have a raw feeling to them, while maintaining a polished look. I have been experimenting with naked clay bodies and alternative firings, such as raku and soda. While each of these techniques can incorporate glazes I allow the processes themselves to add their marks to my pieces instead of competing with the beauty of what the method produces; I consider this to be a gift of the fire. Currently a resident of Tucson, AZ, Lindsay Zike graduated from Arizona State University in 2014, with two undergraduate degrees in Fine Arts with concentrations in Ceramics and Jewelry Metals. 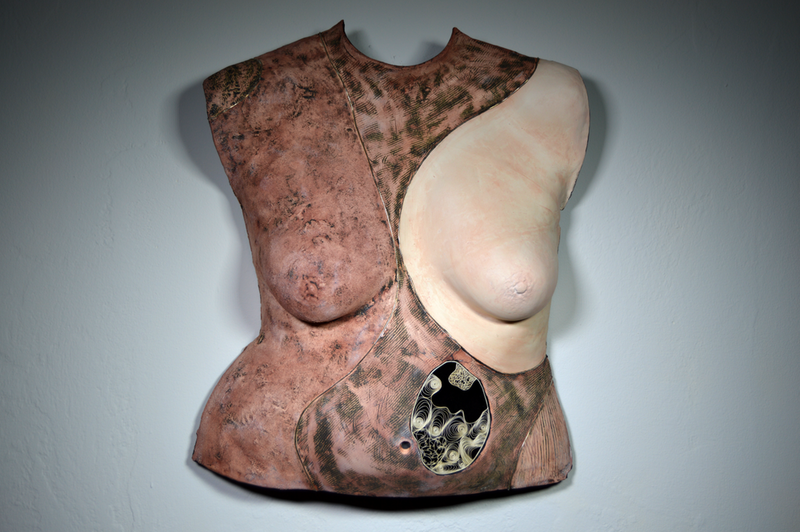 While in school she discovered a love for ancient designs and techniques in both mediums which she continues to explore in her studio practices. Growing up a military brat instilled an unending desire to explore and travel; this was reinforced by her Naval service. She had the honor to serve with the US Navy Ceremonial Guard in Washington D.C. She then went on to repair helicopters with Helicopter Anti-Submarine Squadron Fourteen "Chargers" (HS-14) aboard the USS Kitty Hawk (CV-63) in Japan, traveling around the Pacific Ocean. The experiences of her service are a constant source of inspiration for her work.